The sweet, refreshing taste of shellfish is almost synonymous with summers at the shore. Most varieties take less time to prepare than red meat or chicken and, usually, you don’t need too many ingredients to highlight the natural flavors. The only drawback is the effort one must occasionally suffer before it can be eaten. I’ll forever admire from afar the crab boil concept. It’s incredibly appealing – the image of sitting at a newspaper lined picnic table with a plastic bib, drinking beers and cracking through the bright red, Old Bay doused crustaceans. It’s just far too much work to endure when one is hungry, and I’d rather not be left with gashes on my fingers. I’m more of a pre-cooked, shelled and de-veined shrimp or lump crab meat in a can kind of gal. Ready-made shellfish and seafood is not only great to just pick at on its own, but is also a quick and easy way to dress up pasta or a salad. 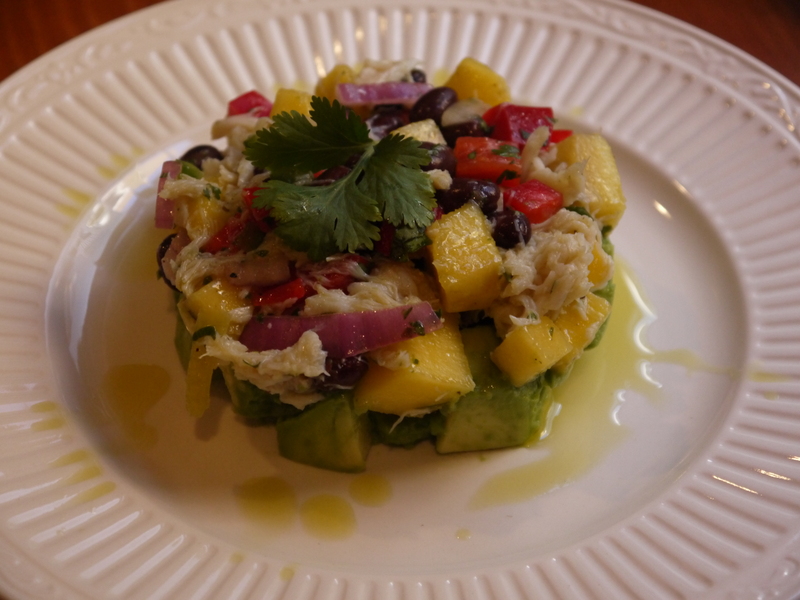 This healthy recipe showcases lump crab meat with an array of colorful veggies and juicy mango. Squeeze the juice from 1 half of the lime into a bowl. Add the olive oil and cilantro and whisk well. 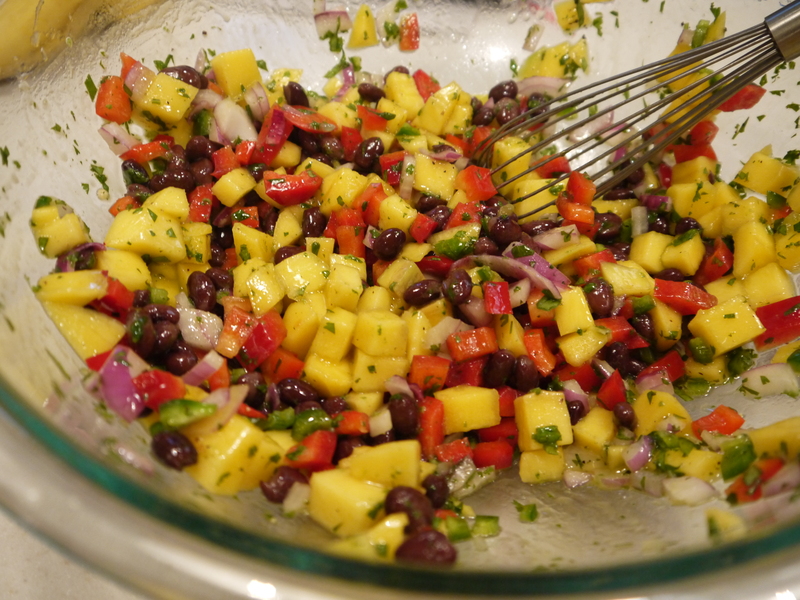 Add the mango, red pepper, onion, jalapeno, black beans and lime zest and toss to coat. Gently stir in the crab meat to keep it from breaking up. Set aside. In a separate bowl, toss avocados with juice from remaining lime half. Spoon onto plate and top with crab mixture. I was inspired to get creative with crab meat when I scored a can of it at the grocery store for a decent price. While I feel as if I could just eat the entire container myself, a half a pound goes a long way when paired with black beans and veggies. There’s a variety of appealing and textures, from the soft avocados to the crunchy pepper. Sweet mango compliments the fresh flavor of delicate chunks of crab meat. You could definitely toss the avocados into the crab mixture with the other ingredients to save yourself from dirtying another bowl. I rode my wave of inspiration and used a ring mold to layer the crab mixture on top of the avocado for a fancy presentation. I’ll still always have the fantasy of getting messy at a crab boil, but I’ll never be patient enough to do all of the work, especially now that I have the taste of this salad in my memory.